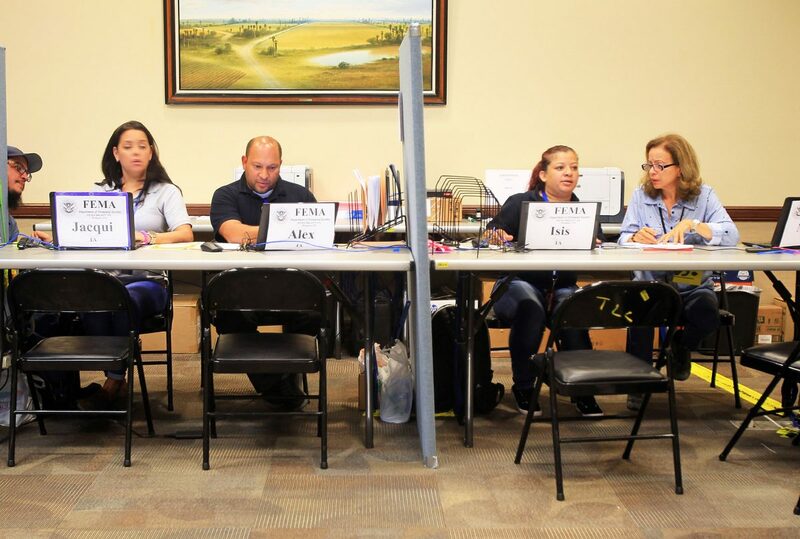 FEMA workers collect data on storm damage to homeowners who have applied for assistance at the FEMA Disaster Recovery Center Tuesday, July 17, 2018, in Weslaco. The sudden rainstorms that caused widespread flooding throughout the Rio Grande Valley at the end of June took most people by surprise; communities didn’t have enough notice of the storms’ severity in time to hand out sandbags, clean drainage systems or deplete resacas so they could take more runoff from the streets. For the most part, we’re lucky the damage from the floods wasn’t more severe. But some local officials might be thinking, too bad it wasn’t. The Federal Emergency Management Agency has denied federal assistance to South Texas cities and counties to repair damage to roads, drainage systems and other infrastructure that the flooding caused. It says the amount of damage wasn’t enough to warrant the help. FEMA’s assessment came to an estimated $18 million in damages to government property and easements. The agency said it would not help unless the damages exceeded $36.7 million. Local officials say the assessment was incomplete and missed several damaged roads as well as irrigation and drainage systems. School districts also reported significant damage to land, buildings and buses. The officials have requested another FEMA assessment. If the initial assessment was incomplete, then of course a new review is warranted. But we also question why the federal agency would set a floor for disaster relief that would either leave damaged property unrepaired or inspire officials to look for ways to pad the damages in order to get more funding. It seems more logical that the agency should be more willing to allocate smaller amounts, which would save taxpayers money and leave more funds in reserve for future claims elsewhere. Denying the assistance now could lead to greater damage, and expense, later. An initial storm might create cracks and small potholes in local roads. But if they aren’t repaired quickly they will only get larger and further weaken the overall road’s integrity, especially when another storm hits. And that’s a major consideration in the Valley, which lies within the Atlantic hurricane corridor. At this writing, one storm system is churning in the Gulf of Mexico and four others in the Atlantic Ocean, with three of them headed our way. We hope local officials are able to convince FEMA representatives to re-evaluate the areas affected by the June floods — especially in the Mid-Valley, where some areas were underwater for weeks and damage to underlying structures might not become apparent until another major event strains the system. More importantly, we hope federal officials come to see the prudence of making small investments early rather than allow the damage to increase to the point that more expensive repairs are needed.